Cook the pasta according to package directions adding the broccoli for the last 5 minutes. While the pasta cooks, heat the butter and olive oil over medium heat in a pan or skillet. Add the garlic and saute until tender. Add the shrimp, parsley, lemon juice and salt. Cook until shrimp are pink on both sides. 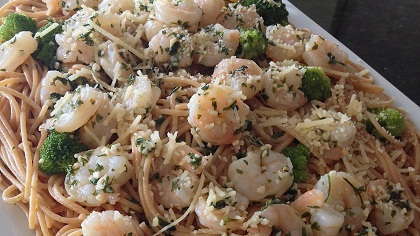 Toss the pasta and broccoli with the shrimp mixture.